It’s crunch time here at the GGN offices. There’s not a whole lot of news, but there are a ton of games to play. In light of that, I thought I’d go in depth on one of the games I recently reviewed. As always, you should keep your eyes peeled, since GGN has new reviews in the pipeline. In my Paper Mario Sticker Star review the other day, I mentioned that Sticker Star’s combat system made interesting fights more accessible. However, in order to keep the review to the point, I hit the highlights without getting to the interesting bits. The biggest strength of Sticker Star’s combat is its ability to engage players with short attention spans. For a game that splits its world map into bite-size stages, it makes perfect sense; from top to bottom, the game is built for providing a satisfying experience with the smallest amount of investment. It begins with the process of collecting and using stickers, the most basic element of combat. In order to perform any move, you must have a sticker for it, and once you use it, that sticker is banished forever to a discard pile. Granted, you’ll find plenty of most types of stickers; oftentimes you’ll have half a page dedicated to Jump stickers, for instance. Stages are littered with stickers to be plucked, and combat consumes at least one sticker per turn, so you’re constantly rotating your sticker set. The bottom screen is your sticker album. With each passing world in Paper Mario Sticker Star, you earn new pages in your album, giving you more capacity to store stickers. It may be mere busywork, but Sticker Star keeps you engaged with filling your sticker album. There’s minimal investment involved, since you can just buy stickers from a store or pick them up off the scenery, but you always have the satisfaction of knowing you’re immediately contributing to the attacks you can perform in the next battle. Even if you stick (hah) to safe, reliable stickers like Jump and Hammer, you’re perpetually using up old ones and refilling your album with new copies. 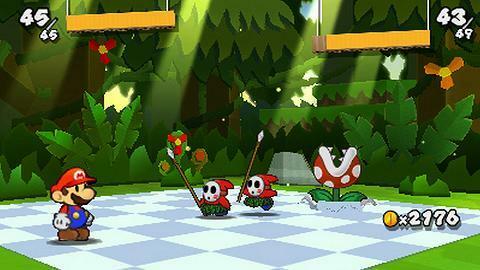 In the original Paper Mario, however, if you stuck to those two basic attacks, they were always on hand. In theory, it doesn’t seem like there’s much difference—either way, you’re using the two basic attacks over and over. 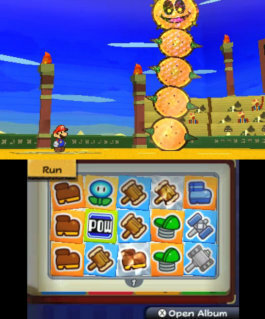 In practice, however, Sticker Star is able to attach even the most plain of your options to the satisfaction of collecting stuff. The tradeoff, however, is that Sticker Star gives up Paper Mario’s long-term satisfaction. In Paper Mario, you can find or buy badges that gave Mario special attributes; one might give him a powerful magic-consuming attack, and another might increase his evasion rate while his HP is low. However, you can only use so many badges, and the primary way to earn more badge capacity is by spending experience points. Many of the better badges you can only find later in the game or buy once you find enough Star Pieces in the world, so putting together an optimal badge set takes quite a bit of investment. Compare this to Sticker Star, which gives you almost every sort of sticker within the first two worlds. There are a few additions here and there, but for the most part, your options won’t change once the game gets going. This can lead to some pacing issues. While Paper Mario’s badges might take some time to get going, you’re always building towards something; in Sticker Star, the sticker variety faces the threat of losing steam halfway through the game. In Sticker Star’s defense, though, there is a large variety, and I didn’t immediately start using every sort of sticker. I definitely took some time before I had fully experimented with everything and pegged down each sticker’s best use. You’re constantly facing new enemies, too; even if you get tired of your stickers, you won’t grow weary of your sparring mates. At the end of the day, the original Paper Mario sought to streamline the JRPG experience. Instead of building a character through a skill tree or class system, you had customizable badges which could be clipped on or off at a moment’s notice. Instead of culling a party with complementary attributes and skills, you had helpers with a few special moves each. Sticker Star continues the streamlining process. In doing so, it removes any pacing directly imposed by the game on building Mario’s character, since you’re free to experiment at your own pace. I found it gratifying; I never cared for Paper Mario’s middling Badge system, and there were enough sticker types in Sticker Star to keep me experimenting even after I had encountered everything. I also appreciated the one-sticker-per-move rule, because it gave my moveset a dynamic feel that constantly required tending and rethinking. Sticker Star may not reward investment like Paper Mario, but it does offer a more dynamic experience.